What do we do with food insecurity? Published in El Pais, 1 September 2018. In the last 45 years in Bolivia, there have been health programs aiming at malnutrition (lack of food). However, in recent years the phenomenon of overweight and obesity has appeared and so, calls for taking other types of actions. The results of an investigation in the Andean zone of Cochabamba in which I participated, indicate that an average daily dish contains values that very different from what is recommended. The consumption of cereals is 3.4 times more, 2.3 times more of tubercle. But the most worrying thing is that in meat-legumes-dairy (protein and calcium) only half is consumend of what is recommended, 6 times less in fruit-vegetables and 8 times less liquids. This shows that there is food insecurity in these communities, a fact that is in line with the study of the World Food Program (2005). Almost 70% of what is produced in the rural area is for own consumption. 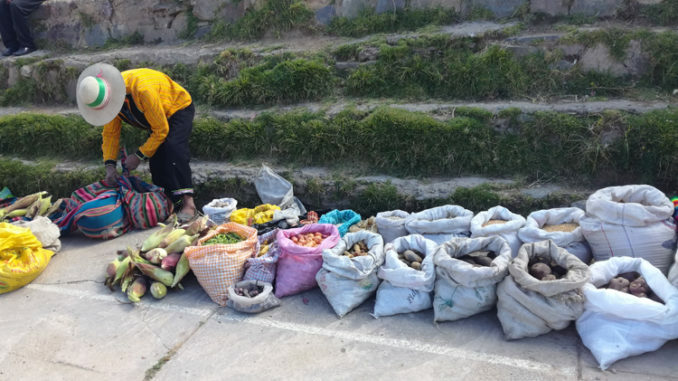 But as barter has disappeared, money has become essential for the purchase of food that is not produced and this has caused communities to focus on producing what is sold (basically potato) leaving behind the diversity of native crops which has increased the problem. And with this migration has increased, which, impedes us to think about sustainable actions due to the lack of people needed for production. Many already live in other regions of the country and only return to the sowing, harvest and other periods. There is food resilience but is it of quality? Many have changed quinoa, tarwi, dry beans for noodles because of the price that today plays a significant role. Buying 400 gr of quinoa is the same as buying 3.5 bags of 400 gr of noodles. Quality for quantity, and the quantity ensures food for several days. However, the amount that feeds can contribute to overweight or obesity that are the origin for diabetes, cardiovascular diseases, joint inflammations and others that negatively impact the development of a country and the health system. Actions must have a comprehensive vision. Addressing issues of migration, crop diversity, access to food is important. Many do not have access to a health center. The health system has to reach these communities to teach about nutrition and good health practices. Also, teach to cook healthy foods that have been forgotten and support with crop diversification (irrigation, seeds, fertilizer). PhD. in Economics and International politics. Works in health and economics research.